I was back home this past week visiting my family and friends in the Buffalo area. I only make it back about twice a year these days so each visit is jam packed with as much as possible. And by that I mean as much food and drink as possible! My first meal of the trip was Thursday night at where else but the Bar Bill. If you want to see pics go here but the wings and weck were perfect as always. Friday rolled around and after a gluttonous stop at Mighty Taco it was time for a weekend tradition- Fish Fry. 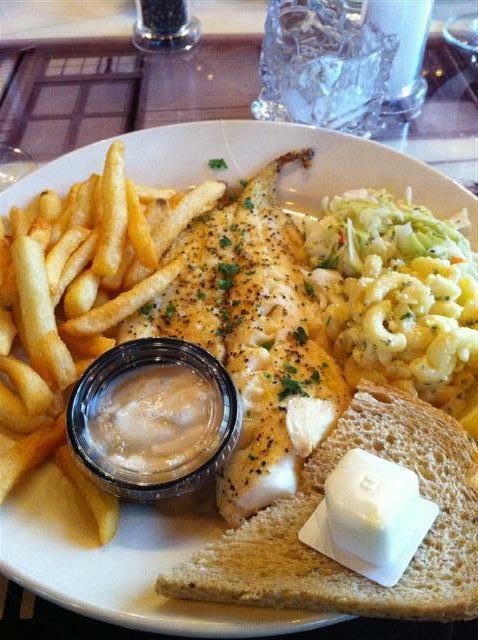 Almost every single restaurant in the Western New York area have fish fry’s on Fridays and people line up out the door for the hefty platters. It was no different in East Aurora at newly food centric Riley Street Station. We showed up at 4:45 and almost couldn’t get a seat. Buffalo LOVES the early Bird dinners! I went for the Broiled Haddock which came with the classic accompaniments of coleslaw, macaroni salad, french fries and a plastic cup of tarter sauce. This was a really big piece of haddock and cooked very well. Unfortunately though someone got a little heavy handed with the seasoning on top and some bites were so peppery it made my throat burn. They could also add some more pickle to their tarter sauce but the fries were extra crispy and the dining companions were great. Overall it was a success. 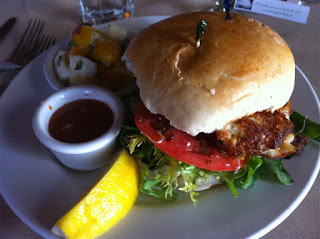 Saturday was lunch at Rick’s on Main Street where I tried out the Crab Cake Sandwich and Chicken Salad platter. Now to me, crab cake’s already have enough breading so I just took the roll off and enjoyed them on their own. There were huge chunks of sweet crab meat with sour and sweet thai chili sauce for dipping. Yum!!! The Chicken Salad Platter was absolutely enormous. It came stuffed inside a tomato with a blueberry muffin and fruit salad. It could have been breakfast and lunch combined! Unfortunately it was a little like the haddock at Riley’s. Some bites perfect, some super peppery. Maybe it’s a WNY thing? But I really enjoyed the meal and our service was beyond fantastic. Sunday was all about pizza and beer. I woke up to some super saucy, super crispy pepperoni pizza and a chicken finger sub from Pasquales and then headed into the city to do a little bar hopping. Our first stop was the recently opened beer bar the Blue Monk. With 30 awesome drafts and over 50 different bottles this place is a sight for sore eyes in Labatt Blue centric Buffalo. Ayinger, Goosle Island, Unibrou, Ommegang, Kwak; the names go on and on. 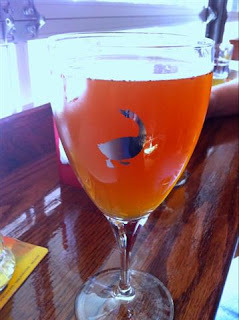 I didn’t enjoy this Belgian sour ale at all but I loved the Goose Island glass it came in. And isn’t half the fun of beer pubs trying something new? Blue Monk didn’t have food when I was there but their menu is going to include pots of mussels and duck fat fries! Know what else….they start selling food today!!! I was three days off unfortunately. I highly suggest you Buffalonians check it out and report back if you can. I really want those duck fat fries! 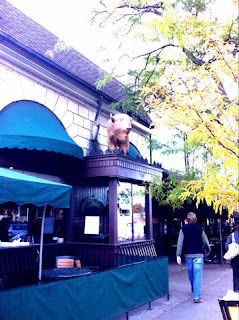 From there we moved onto to an iconic Buffalo Bar Coles (hence the big Buffalo out front). 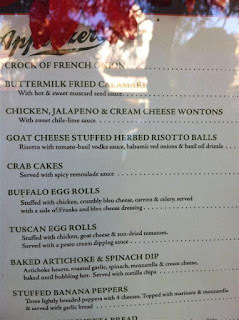 We only had chicken fingers there but I had to get a picture of the appetizer menu. Only in Buffalo could you order something sounding like those Egg Rolls. Side of franks- that’s rough! After that we hit up Mr. Goodbar next door and then headed back into East Aurora for some Duvel’s and dinner at Tantalus. 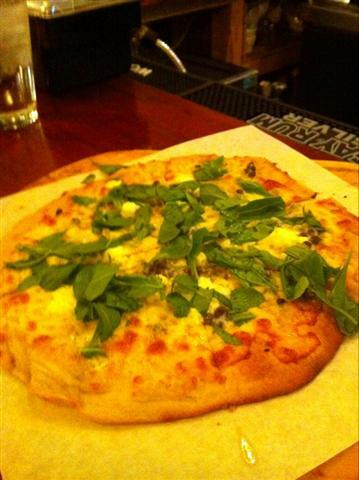 This is our grilled pizza with gorgenzola, arugula, and garlic. The one thing I love about Tantalus pizza is the dough. It’s incredibly thin, almost like a cracker (I would compare it to Vezzo here in the city) with little charred pockets here and there. This pizza would have been pretty good except they forgot to put something on. The garlic! After a few very bland bites we identified the problem and were given some crushed garlic for the side. This certainly made it better but not great. 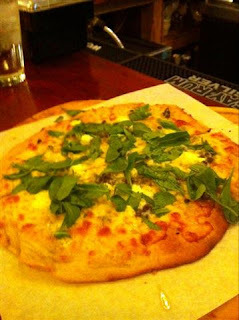 I enjoyed their bacon, spinach and goat cheese pizza much better. After all this food and beer you would think I’d call it quits for the day but no. We ended the evening just as my trip had begun with chicken wings at the Bar Bill. So even though my flight was delayed getting into Buffalo and out (damn you Jetblue) I had a great time and really packed in as much food and drink as possible. I'm really hoping Buffalo continues to evolve it's food and drink. Good beer places are a start. Maybe the Blue Monk and Tantalus will start serving beer flights so patrons could try different kinds of beer. I think this would draw in more crowds and give Labatt Blue drinkers an opportunity to try something new. Well here's to hoping. Happy Halloween with Banana Cake Truffles!! Food, Wine and Beer This Week- I Got You Covered!